As you might know, I’ve been teasing something awesome coming out for the gluten-free community. The embargo is lifted, the product is launched, and I’m ready to introduce you to my partner, Gluten Detective.I had a chance to try Gluten Detective months ago, before they changed their name (that’s why my images from the big test are called Gluten Detect and have the old packaging) and released the product to everyone at the end of October after a great show at FNCE. 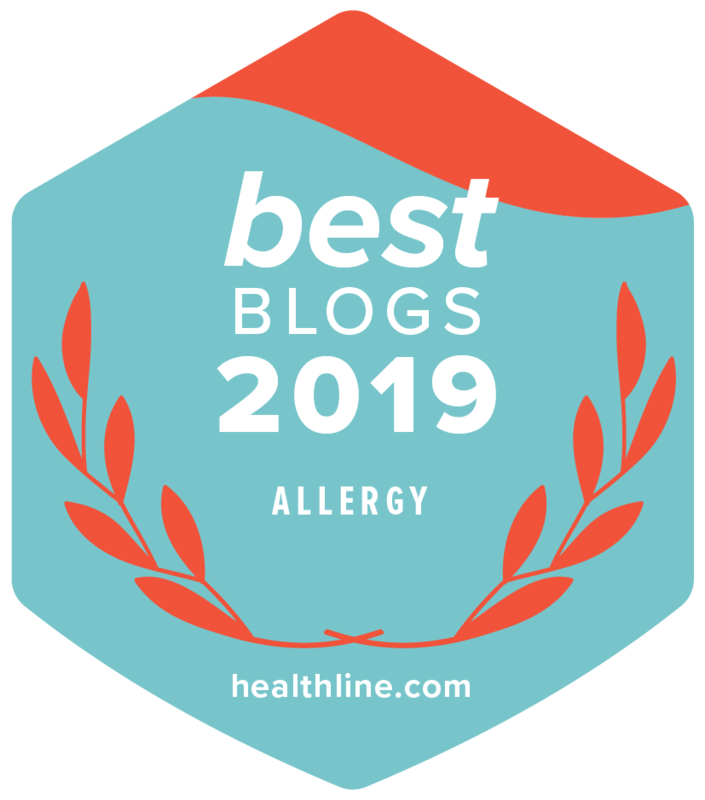 I have partnered with them on a promotion, because I feel like this tool will be incredibly valuable for the celiac community. I am so excited for you, our Celiac and the Beast readers to finally get to know Gluten Detective. Bottom line: What is Gluten Detective? Gluten Detective at-home use tests can help you identify if you’ve recently consumed gluten. You might be scratching your head – we already have EZ Gluten and Nima Sensor to detect gluten in the food we might eat, why would we need a test to see if I’ve consumed gluten? Great question! Monitor your gluten consumption at home – are you on track for healing? 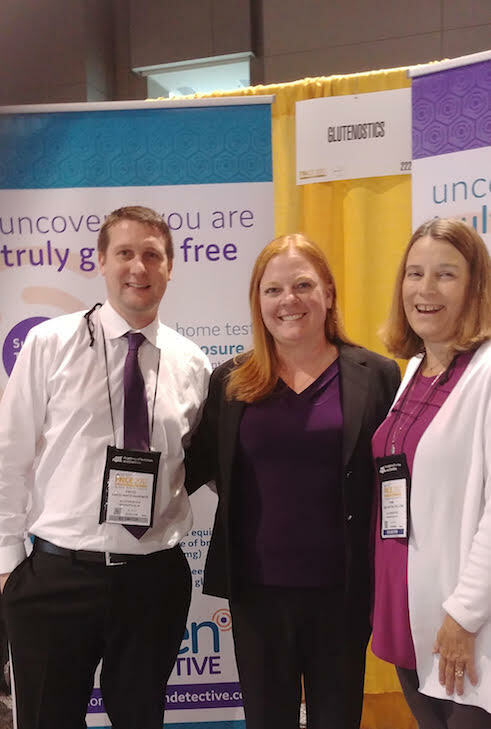 Gluten Detective the first test for gluten consumption in North America that are over-the-counter – and available to you without a doctor. And lucky you, you get a choice of urine tests or stool tests. Now I know that some of you will never get this up-close-and-personal with your poop, but I really feel like we need to get over our fear of meeting our waste. Because if you can’t handle your poop, you can never get to experience a cool test like this. 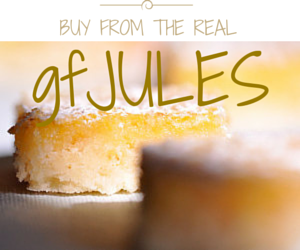 Check out their press release on Celiac Disease Foundation’s website! 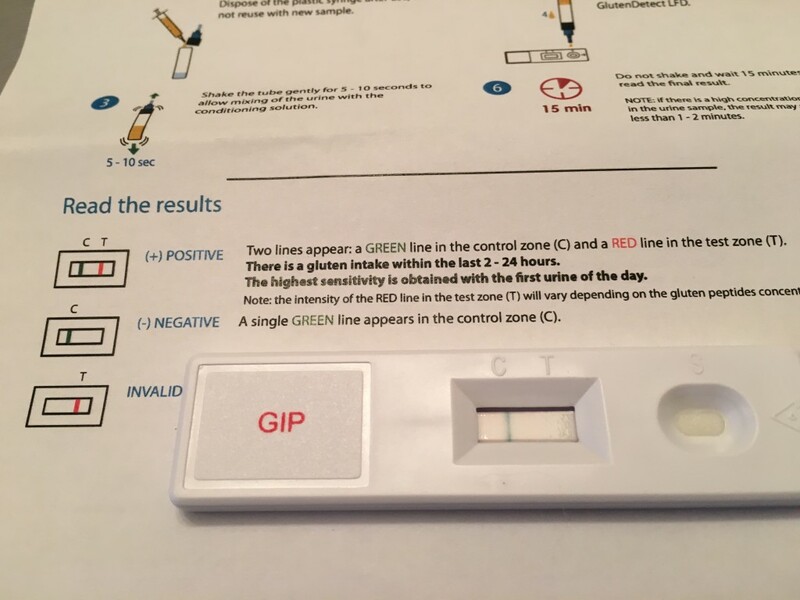 Each Gluten Detective urine test contains a test strip and all you need to run the test easily at home. You’ll be able to detect gluten in your urine for around 6-16 hours after you eat it. 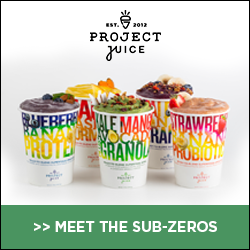 You’ve got to be pretty fast to run the urine test, and this is mostly for meals where you’ve blatantly eaten gluten. Ex. did I just eat a plate of regular pasta or gluten-free pasta? 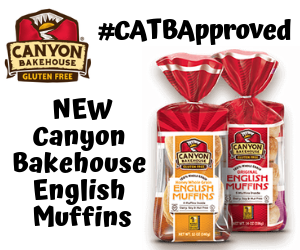 Was that gluten-free hamburger bun really gluten free? 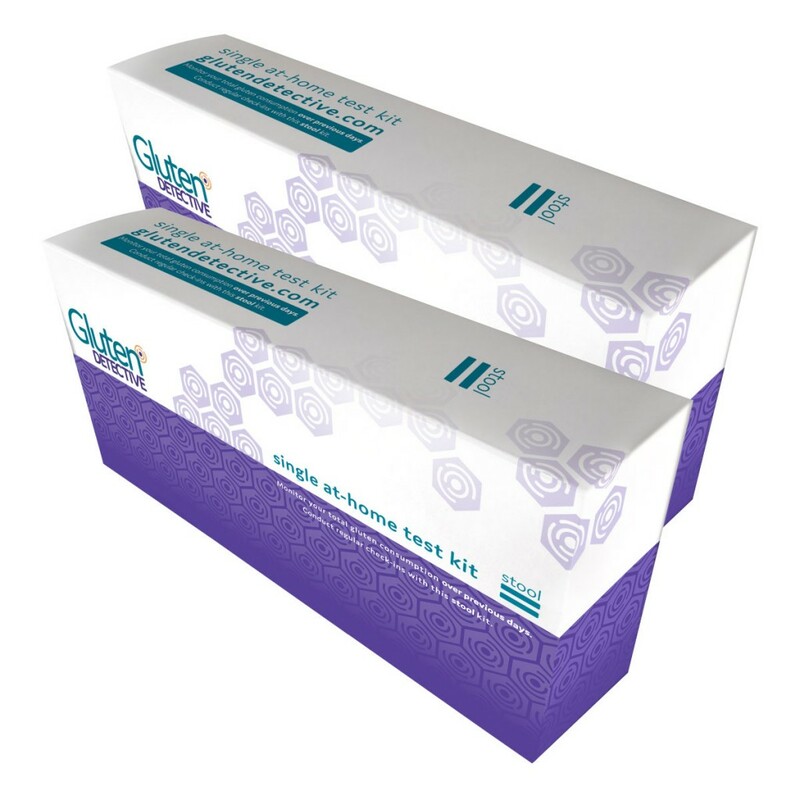 Each Gluten Detective stool test contains a test strips and all you need (including the gloves!) to run the tests at home. 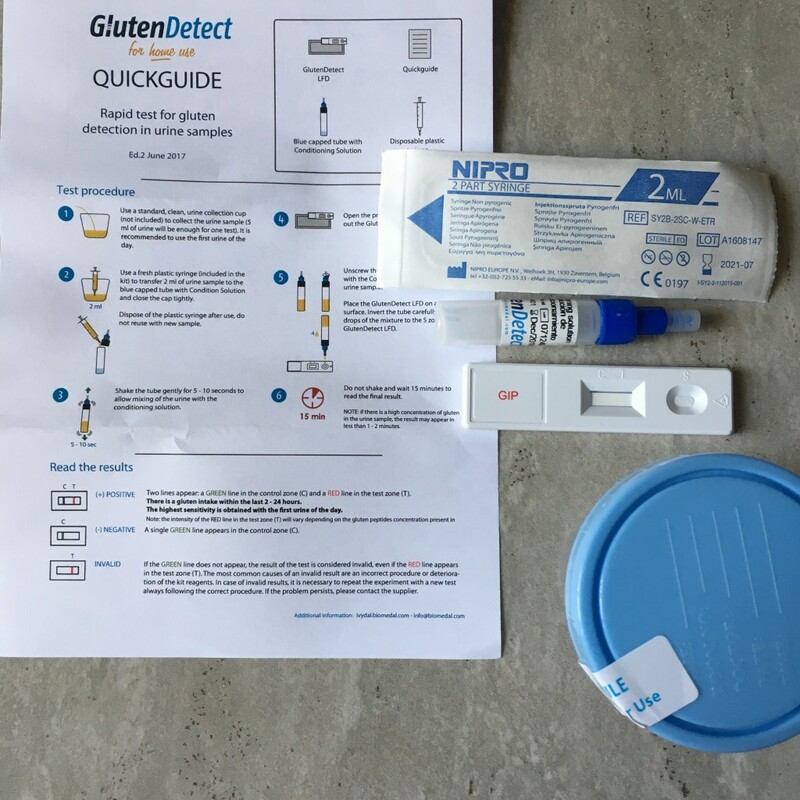 Gluten can appear in the stool 2 days post consumption and remain in your stool for several days, so it’s easy to test for gluten consumption days later, if it takes longer for your gluten symptoms to show. 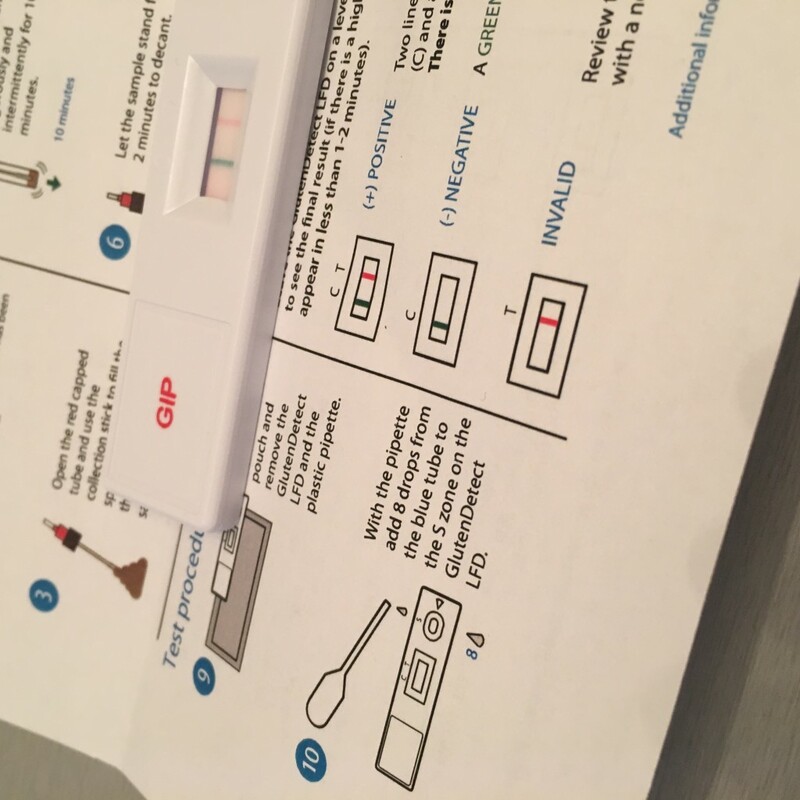 This test is the best test, and what I recommend purchasing because it is more accurate than the urine test and can pick up lower-levels of gluten – ex. cross contamination. You don’t have to eat a regular hamburger bun to see if you’ve gotten glutened. People who always blame gluten. Feeling slightly under the weather? Blame gluten. Stomachache? Blame gluten. Fight with boyfriend? Blame gluten. Now you can actually check to see if gluten is to blame for your symptoms. People who think they’re still getting low levels of contamination in their diet. Now you can know for sure. Wondering if another digestive symptom is to blame for gluten? Is this flare-up IBS related or gluten related? Now you can know. Asymptomatic celiacs who want to make sure they’re on the right track with their diet. Cheaters. People that will cheat on their diet and then use this test to see if they’re getting by with undetectable amounts of gluten. NOPE. People that take weeks to develop symptoms. You can only test for up to a week with a stool test. If you develop symptoms weeks later, it’s too late to test your stool for gluten. People who cannot fathom handling urine or stool, even with gloves on. Did Erica really touch poop? Of course I did! With gloves on, of course. 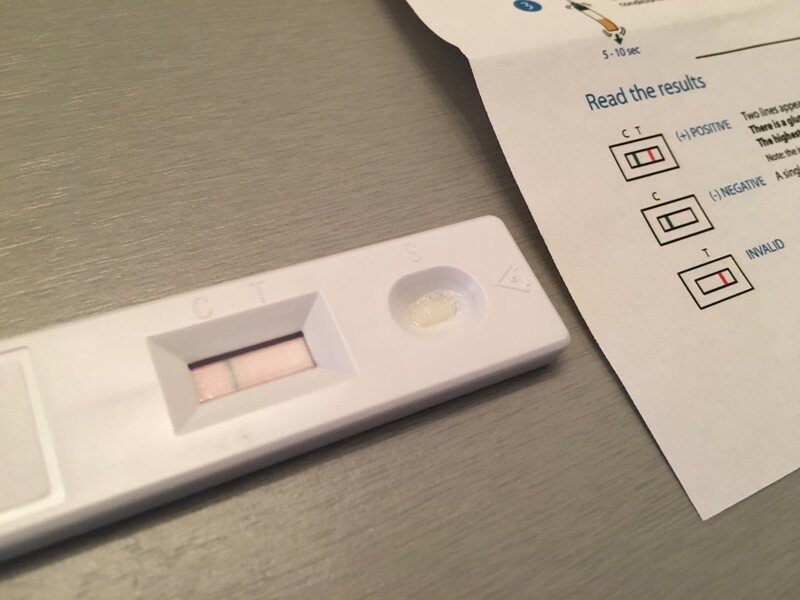 I not only used both tests on myself – the urine and the stool – and came up free from gluten (even after recently traveling – take that, celiac), but I also tested a gluten-eater’s poop. I mean, for science – I had to make sure the test worked. Now, I’m not going to go into the crazy details that includes asking for SOMEONE ELSE’S POOP that eats gluten, but it was a real challenge for me. I mean, I have no problem handling poop – but asking for poop is a different story. BUT, I did it because I love you guys and I wouldn’t promote a product without knowing that it worked. And of course, it worked. Thanks stool sample! Hopefully I’ve peaked your interest enough for you to make your first Gluten Detective purchase. 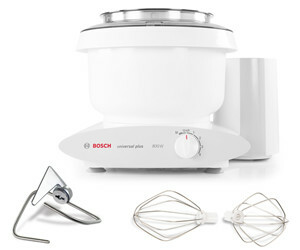 I hope you’re as excited about this new product as I am! 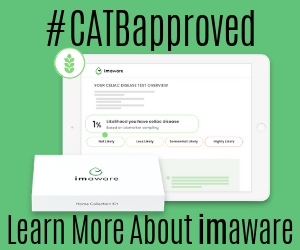 The cost is $45 for 2 urine tests (sold together in a pack), $45.00 for 2 stool tests (sold together in a pack) or $45 for a pack containing both tests. You can use the coupon code ‘welcometogd’ for 25% off your first order. 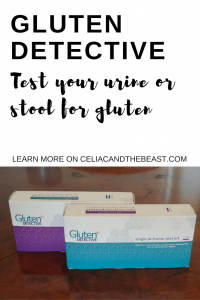 Want to be a lucky Celiac and the Beast reader and win an at-home gluten detection kit with Gluten Detective? Of course you do! Enter using the widget below! 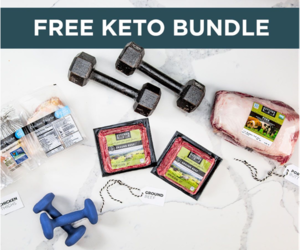 If you enter your email address you will be signed up to Celiac and the Beast email list and the Gluten Detective email list. 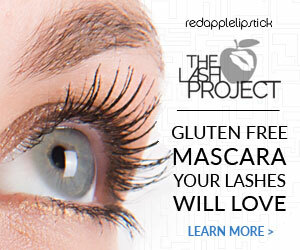 I am a paid partner of Gluten Detective, but I am so impressed with this new technology, I hope you love it too! This is very interesting. 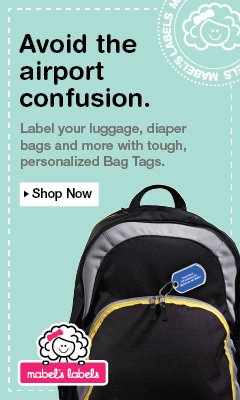 I think I would have these for emergency purposes or when traveling! I like the urine one the best. This sounds awesome! I mean – Wow, you’ll finally tell if it’s the flu, gluten, (Gall bladder attack for me…) That’s neat. I think this is a great idea! We have a hard time with my daughter(10) knowing if shes getting sick or just got cross contaminated. I am loving all these different devices to detect gluten, Unfortunately they can be on the expensive side but hoping to get them in the future. I will definitely try this out! Thanks for posting. This is an intriguing new concept. I’m asymptomatic and NEVER know if I get glutened so I look forward to using this! This is a very intresting concept. Would love this for my 8 year old and myself. Tempted for sure. Might just have to purchase! Very interesting. I would be really interested in the urine test one. This sounds like an amazing product that I would get so much use out of; I just wish that I could afford to regularly use something like this. I love this! 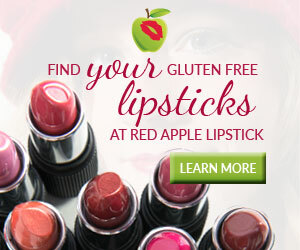 I would use it to make sure I’m not getting gluten contamination into my gluten free diet. Wow! This is so interesting. I would be so curious to try this. Is it currently available in the US only? I think this is fascinating. I’d probably prefer the urine test. I think it would be handy when I get sick to know if it was caused by restaurant/take-out food being contaminated – I never know for sure if I should try restaurants again after getting sick because I do have other mild allergies and GI issues but obviously being glutened is more serious. I think that this is an interesting way to test for gluten in the body, and I’m curious to see how well it would actually work for someone like me. I’m not exactly fond of the idea of collecting stool samples though (I’d prefer to have the test with better accuracy). Oh this would be so helpful for me . I am the only one with Celiac disease, and cook two meals almost nightly…one for me and one for the rest of the family. I always wonder about cross contamination, even though I am careful. Silverware…pots and pans…dishwasher…sharing a ketchup bottle. All these things always make me wonder and I would love to know for sure!